I haven't bought an iPod since 2009. However, because Apple chose to kill what I think is the best iPod of all time today, I decided it was time to take the leap and buy one IF I could find it online. I don't buy in-store because….well, I just can't stand Apple Stores any longer, but that's another story. I remember seeing my first iPod, I think it was 2001. I was on my way to visit someone and I saw a kid outside the building with this strange device with white headphones. I had to see it. At that point in my life, you see, I wasn't much of a gadget geek. I went through a 10 year period where I felt there was really no gadget that was very interesting so I lost all my teenage gadgety lust, but the iPod I saw that day, for whatever reason, rekindled my interest in electronics. The feelings I felt when looking at that "brick" of an iPod wasn't something I had felt since I first saw a Sony Walkman in 1981. Like the Walkman, the iPod was so unique, so different, that I felt I would have to have one of those. However peaked I was, it still took me 3 more years before I finally purchased one. I had been a "PC guy" for several years and it wasn't until I gave Apple another chance (I came from an Apple II home) with a purchase of a quick silver iMac that I took the leap and purchased an iPod. 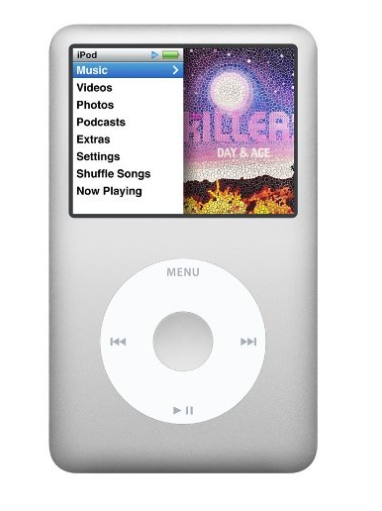 I still like the feel of the classic iPods over the touch iPods. There is something about the feel of a "substantial" electronic device I just don't get from the ultra thin Touch. The click wheel , the brushed aluminum….ah I cannot NOT buy the last of this generation of device. It still feels old school, and I like it! Thanks to Amazon, I found it and will be enjoying it on Thursday.